For Day 28 of this series, I am going to talk a little bit about some upcoming developments in Intel desktop chipsets and Intel consumer level SSDs, and how they will work together. This technology is relevant for desktop systems initially, but will probably show up in laptop systems pretty quickly also. Tom’s Hardware had a story back in March that had some details about the Intel Z68 chipset. Motherboards using the new Z68 chipset are supposed to be on sale on May 11. Earlier this year, motherboard vendors released boards based on the Intel P67 and H67 chipsets. One thing to keep in mind is that the current Intel P67 and H67 chipsets have a number of limitations. With P67, you can overclock the Sandy Bridge CPU, but you can’t use the Quick Sync media accelerator inside Intel’s Sandy Bridge processors, and you cannot use the improved integrated graphics inside the CPU. With the H67, you can’t overclock the the Sandy Bridge CPU, but you can use Quick Synch and the integrated graphics. You basically had to choose between two somewhat unsatisfactory choices. The new Z68 chipset is somewhat of a hybrid between the P67 and the H67 platform controller hubs (PCHs) and was designed to allow overclocking Sandy Bridge CPUs while using the integrated graphics. 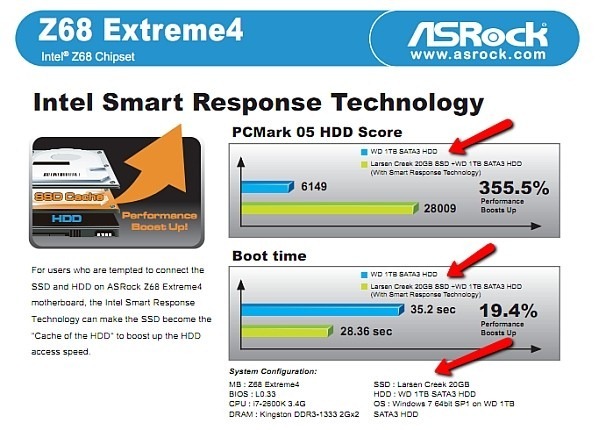 In addition, the Z68 chipset supports Intel Smart Response Technology (SRT), allowing you to use an SSD as a cache to speed up your disk access in many situations, similar to a hybrid hard drive. It will let you use a small (64GB or less), inexpensive SSD as a caching layer in front of your conventional hard drive. The idea is that you install Windows 7 or Windows Server 2008 R2 on the conventional hard drive, then you use Intel’s Rapid Storage Technology application to enable caching for the SSD. This allows the Rapid Storage driver to write data to the SSD the first time it is read from the conventional hard drive. Then, the next time the system needs that data, it will look in the SSD first, and hopefully find it there, for a nice speed boost. The idea is that you can use a small, inexpensive SSD to give a performance boost for reads, while still having a large, inexpensive conventional hard drive for storage space. This combination will never be as good as simply using a large, fast (and expensive SSD), but is a budget alternative to give you some of the benefits of an SSD at a low incremental cost. EndGadget has a post that discusses what is supposed to be a leaked slide that shows Intel’s roadmap for their current and upcoming consumer-grade SSDs. The little 20GB Larsen Creek SSD is what Intel is targeting for this scenario. This entry was posted in Computer Hardware and tagged SSD, Z68. Bookmark the permalink. FYI: we are using the Adaptec maxCache storage controller with SSD Caching http://www.adaptec.com/en-us/products/controllers/hardware/ssd-caching/performance/sas-5805zq/ in 2 of our new SQL Server standard configurations. 4 x 60GB SSDs give us 240Gb 2nd level cache.